How Can Dismore Judge Others? The Committee on Standards and Privileges is becoming a joke. First David Curry was caught for entertaining his mistress at a second home at our expense. He fell on his sword immediately – as he should. Now another member of the Committee, Andrew Dismore, is found to be paying his lover out of expenses and claiming for a second property that housed her “homeopathic surgery” in trendy Notting Hill. Bear in mind his constitutency is only half-an-hour from Westminster on the Northern line and that Dismore has previously enjoyed being London’s most expensive MP for no discernible reason. He thinks he should just ask fellow members of the Committee on Standards and Privileges if they think he should resign. There is a legal principle nemo debet esse iudex in propria causa, “no one should be judge in his own cause”, of which he should be aware given he is a lawyer. He should just have the decency to just resign now that he is reportedly under investigation by the Parliamentary Standards Commissioner. How can the disciplinary process be taken seriously if the Parliamentary Standards Commissioner reports to a Committee which includes someone under a cloud for a pretty outrageous abuse of the expenses system? 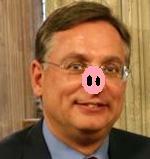 Dismore is a disgrace. See also: Nothing To Do With Me Guv.